Image caption Elizabeth Swaney - a hero or a cheat? If you think the Olympics are all about getting a spot on that podium, think again. Some just want to be there. 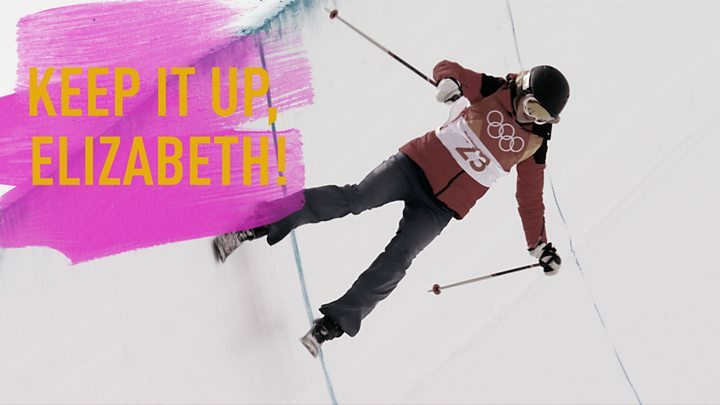 Meet Elizabeth Swaney from the US, who made it to the Winter Olympics with a spectacularly mediocre performance, slipping through a loophole in international qualifying. When she took to the halfpipe in freestyle skiing in Pyeongchang on Monday, she got through the same way she'd done in competitions before: she managed to not fall off her skis. Meandering from one side of the pipe to the other, with no tricks en route and displaying skills many amateurs could lay down without much training, she came a glorious last - but did at least achieve her dream of becoming an Olympian. With what was easily the most original performance of the Games so far, she divided social media into two camps, describing her either as the "best" or the "worst" Olympian of all time. Gold was eventually taken by Canadian Cassie Sharpe, performing a stunning series of jumps and tricks, including a triple spin. Basically, all Swaney did was ski up and down the half pipe, managing decent turns at the top. For the rest of the field, it is that very moment they use to show off their skills, soaring high above the edge of the pipe to perform their tricks. So how do you make it to the Olympics despite having no outstanding skill in your discipline of choice? Swaney is a US citizen and wanted to compete at the Olympics. With no chance in the world of making it into the US team, she found a loophole. She decided to compete for Hungary, the home of her grandparents. Through relentlessly showing up at international competitions she accumulated enough points to then make it to the Olympics, via a quota system designed to allow athletes from many different countries to make it to the Games. These athletes are still supposed to be very good at what they're doing. Swaney isn't, but in Hungary, she wasn't up against any serious competition. She only picked up skiing in her mid 20s and from a sporting perspective was leagues below those she was up against at Pyeongchang. So she did not cheat, but simply used the system - albeit not exactly how it was intended. And that's earned her a very mixed bag of responses, celebrating her as an inspirational fighting spirit but also condemning her as an unfair contestant. Some of this sounds familiar? In 1988, Eddie 'The Eagle' Edwards became Britain's first ski jumper at the Olympics in decades. He used a very similar strategy: pick a sport where your country doesn't really have anyone competing and then compete in international championships to eventually end up an Olympian. Some of those critical of Swaney's attendance at the Games have said that at least it might lead to a change of regulations to close that loophole for the future. For now, the unlikely athlete appears to have proven the point that indeed it's not the winning but the taking part that counts.